The time spent by each member of your team on tasks is logged here. This is helpful to be precise in billing clients, to keep track of the pace of the project, and also to identify bottlenecks and resolve them quickly. 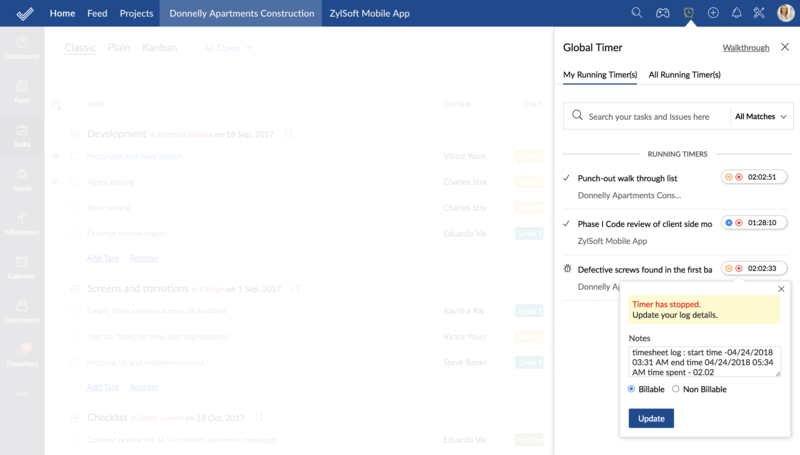 You can use the timers in Zoho Projects to track time spent on each task. When the task is complete, the time spent is automatically added to your timesheet. If you're going the DIY route, you can manually add any time spent as well. Managers can review time logged by their team and make determinations about billable hours and actions. You can manage all the timers clocking time on various tasks with the Global timer widget. You can start and stop timers, and notify team members via comments. You can export timesheets in xls, csv, and pdf formats. Projects Report gives a bird's-eye view of time spent on each project of yours. Also, timesheet reports with time spent on each client and reports with time taken by each employee are available.